Karnala Bird Sanctuary is located in Panvel Taluka of Raigad District. The sanctuary is quite small with an area of 4.27 Sq.kms. The sanctuary is very rich in avifauna and harbours 147 species of resident and 37 species of migratory birds who visit the sanctuary during winters. Two rare birds i.e. Ashy Minimet and Spotted heart woodpeckers have been sighted here. Vegetation typifies moist deciduous forest and is characterised by species such as Koshimb, mango, nana, kulu, kalam, asana, umbar and teak in the top canopy. The ecological conditions of the tract favour a large variety of bird population. The forests are also ideal as a harbourage to wild animals. A casual walk through the forests is an unfailing source of joy, with the list of bird-song ringing in the air. The sanctuary abounds in bird life and during the migrating season from October to April as many as 140 species of birds have been recorded. Karnala has two distinct seasons from the point of viess of the bird-watcher. At the onset of rains, one can see the paradise flycatcher with its fairy-like white streamers, the shama or the magpie robin and the malabar whistling thrush which are some of the most melodious avian songsters. 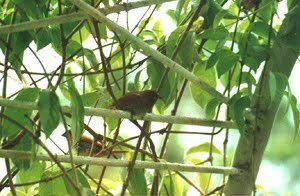 A variety of other birds is also seen nesting in the forest. The racket-tailed drongo also nests here. Its skill in the air and felicity to mimic the call of other birds make it a great favourite amongst the bird-watchers. The golden backed woodpecker and the heart-spotted woodpecker are rather uncommon. In winter, the migrants take over and the pattern of bird life changes. The migrants include a variety of birds such as the blackbird, the blue-headed rock-thrush, the bluethroat, the red breasted flycatcher, the ashy minivet, the black headed cuckoo-shrike and a host of others. Though Karnala is principally a bird sanctuary, many other interesting forms wildlife like wild boar, the four-horned antelope, the muntjak and the common langur also occur here. Karnala Bird Sanctuary is a major attraction to the visitors of Mumbai, Thane and other nearby towns. About one hundred thousands local tourists visit the sanctuary every year. Karnala is a paradise for bird watchers. 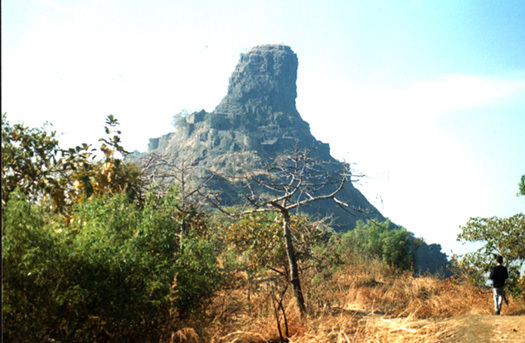 One can also visit Nature Interpretation Centre and trek down to famous Karnala Fort located amidst sanctuary. Apart from being a place of interest to the naturalist, Karnala is redolent of martial history. Karnala Fort or the 'Funnel Hill' as it is called, stands 475 metres high. Its command of the high road between Bhorghat and the rivers of Panvel and Apta, must have from the earliest time, made Karnala a place of strategic importance. Two gateways one at the foot and the other at the top of the rock-hewn steps lead to a dual gateway with a chamber in between. There are two inscriptions in the Fort, one in Marathi and the other in Persain. The Fort has a cheqered history of having passed through the hands of Muslim, Portuguese and Maratha rulers. The sanctuary provides excellent facilities for trekking. Nearest Airport: Mumbai (35 Kms.). By Rail: Panvel (15 Kms.) on Mumbai-Goa Konkan Railway. By Road: Karnala Bird Sanctuary is located on Mumbai-Goa Highway No.17 at a distance of 12 Km. from Panvel. The sanctuary has 2 Forest Rest Houses of the Forest Department with 2 suites each. The reservation authority is Dy.C.F. (Wildlife), Thane. Thane (West), Maharashtra India 400 602. MAP : HOW TO REACH KARNALA BIRD SANCTUARY FROM RATNAGIRI? Wonderful picture looks like a beautiful place to visit!